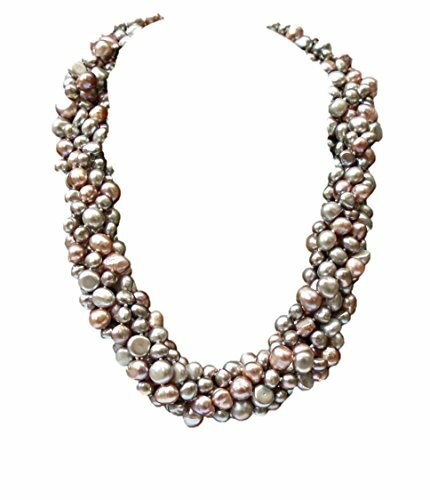 A unique chunky six strand necklace featuring attractive lilac/silver grey/pink 6-8mm baroque Cultured Pearls set on a silver (925) sliding silver clasp. The Cultured Pearls have very good lustre and the bracelet is ideal for fashion, birthdays, informal/formal, valentines, weddings and anniversaries. The length of the necklace will vary depending on how much it is twisted and typically is between 45-47cm twisted or 49cm untwisted. Please note the tubes of the clasp slide in and out of each other so gently pull the end of the tubes in opposite directions to open. It comes in a pretty pouch with a gift card and care of your Cultured Pearls guide. A matching necklace is also available. We pride ourselves on our excellent service, quality and speed of delivery. All our Cultured Pearl jewellery features genuine Cultured Pearls which are carefully selected by us.